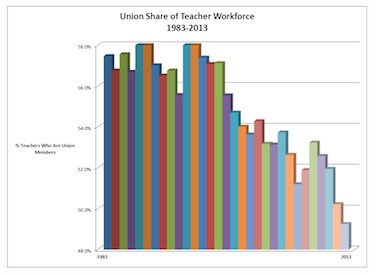 Data confirms non-union teachers are the majority in U.S. There are now more non-union teachers in America than there are teachers who belong to a union, according to data analyzed by the blog Education Intelligence Agency. The data confirms information that first came to light last year, which examined data from the Bureau of Labor Statistics (BLS) and unionstats.com. Well, private schools and non-union charters cut into it, but it is more likely due to the population growth in Southern and Mountain states at the expense of union-heavy Northeastern states. Toss in recent events in Wisconsin, Michigan and Indiana, and it is easy to see how the tables have turned. For the unions, the trends are almost all in the wrong direction. The blog also calculates that of the 4,535,249 teachers employed in elementary, secondary and special education in 2014, only 49 percent were union members. When the BLS started tracking the numbers in 1983, there 2.6 million teachers employed in both public and private schools, and more than 1.5 million of them were union members, for a unionization rate of 57.5 percent.